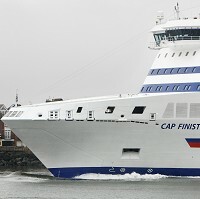 Brittany Ferries has cancelled all crossings from Portsmouth and Plymouth to France and Spain indefinitely after two days of wildcat strikes last week. The protests came from French crew members, unhappy at recent changes in working conditions. The suspension of services to France and Spain has affected many small businesses in the South West, with a large number of travel insurance claims expected from passengers inconvenienced by last week's strikes. Customers with bookings on those routes will be contacted via telephone, email, SMS and Twitter for a refund, although the Poole-Cherbourg passenger service, operated by Condor Ferries, is unaffected by the strikes. Passengers who need to travel are recommended to go via Dover, where arrangements have been made with P&O Ferries and MyFerryLink to allow Brittany Ferries tickets to be used on those carriers' crossings. "Following the series of strikes which has been disrupting our services, our Board has reluctantly taken the decision to tie up the fleet and to cancel all crossings with immediate effect, until further notice," a company statement said. "This decision has not been taken lightly, but we cannot subject our passengers to the on-going uncertainty caused by wildcat strikes and cancellation of services at short notice.